AOMEI Partition Assistant Server, especially designed to meet the needs of small and medium sized business, not only includes all features to make the best use of disk space while minimizing server downtime, but also provides comprehensive solution to disk-related issue. With intuitive and easy-to-use interface, anyone, even non-technical users, can maximize the performance of servers in minutes without having to need an expert. – Innovative and proven disk partitioning technology – more easier, faster, and safer. – All-in-one utility – partition manager, disk tool, OS migration and cloning software. – Latest technologies support – Windows Server 2012 R2, GPT/UEFI and dynamic disk. 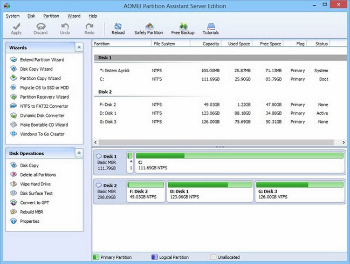 To minimize production server downtime, AOMEI Partition Manager Server brings two key features, which enable you to extend partition without stopping and restarting the server. So you can solve low disk space problem while ensuring business continuity. To maximize disk space usage of your server, AOMEI Partition Software for Windows Server integrates a set of functions, which allow you to rapidly repartition hard drive or change partition size without losing any data on the server. To let your server benefit from and keep up with latest hardware, that is, SSD and 2TB+ hard disk, AOMEI migration’s copy wizard is the best backup utility to update your system and data storage device. – Change disk style from MBR to GPT without data loss, and vice versa. – Change disk type from dynamic to basic without data loss, and vice versa. – Change file system from NTFS to FAT32 without data loss, and vice versa. – Change partition from primary to logical without data loss, and vice versa. – Fast search helps you quickly recover deleted or lost partition. – Full search will scan each sector of the selected disk for recovery. – Make a Windows PE bootable CD/DVD or USB without installing Windows AIK. – Troubleshoot server problems and recover data when the native system fails to boot. – Create Windows 8 To Go bootable USB drive without Windows 8 Enterprise. – Build a portable and fully functional Windows 8 system on USB flash drive.